The Woodlands started brightly and continued to test the Cy Fair defense and camped out in the opposition half. However the Cy Fair defense was strong and refused to allow any clear cut chances for the home side. However the pressure the hosts were exerting was sure to tell, and on 5 minutes no.8 Tom Dixon took a quick tap penalty in front of the posts and crossed to open the scoring with Manu Sanchez adding the simple conversion. Tom Dixon added a second try soon after after first winning a turn-over in midfield after Cy Fair tried to run the ball from deep and then was on hand to take a short pass from Manu Sanchez and cut through the visitors midfield defense, with the simple conversion again added. The only way that Cy Fair were able to get out of their own half was kicking long, but each time they did so strong running from Orrin Bizer, Jordan Bowers and Lane O’Brien put The Woodlands back on the attack, although the hosts couldn’t find a way through the visiting defense until a strong break by Luke Rizzo was stopped 5 meters out and from the quick recycled ball Mattox King was able to drive over the line for a converted try to stretch the lead to 21 points. As the half drew to a close, The Woodlands pack continued to test the Cy Fair defense constantly, with a short line out taking the hosts to within a meter allowing Austin Elliott to drive over for the bonus point try. The game pattern continued with Orrin Bizer setting up good field position after a bursting run following a long kick, Luke Rizzo going close, Hyrum Myers closer before Manu Sanchez was bundled over the line by his pack. Cy Fair gamely stayed competitive and only an excellent cover tackle from full back Orrin Bizer saved a try from the speedy Cy Fair backs. Not to be outdone the Cy Fair forwards drove at the home line from a short penalty and eventually scored. A number of strong Hyrum Myers runs nearly resulted in scoring changes but committed Cy Fair defense held the hosts at bay until Orrin Bizer scorched the away defense to swan dive under the posts. Manu Sanchez added a seventh home try in the final minute to make the score 43 – 7. On a difficult looking pitch, both teams planned to run the ball from the start with first Lamar and then The Woodlands making progress towards the try line. However, after concerted pressure from the visitors pack at the scrum, Woodlands no.8 took a short penalty quickly to open the scoring after 5 minutes. With The Woodlands pack now taking control Lamar were unable to exert any real pressure and after being camped on the Lamar line for several minutes The Woodlands eventually created an opening for Manu Sanchez to slide the ball to Luke Rizzo in midfield for Luke to score under the posts. Manu added the conversion. The Woodlands soon added a third try as good support from Tom Dixon, after a Orrin Bizer line break, resulted in another try under the posts, with Manu Sanchez again adding the conversion. Orrin Bizer was next to cross the line for The Woodlands after some excellent handling in midfield by Will Paxton released Orrin to sprint in and make the score 24-nil. After a disallowed attempt from a long line-out, The Woodlands quickly added another try as Manu Sanchez’s long pass found Luke Rizzo who crossed the line and “splashed down” for his second try, Manu adding the conversion. The Woodlands were now in total control and a strong break down the center by Hyrum Myers lead to a fine move and right winger Jack Burgess scoring in the corner. The Woodlands dominance continued in the second half with a break in midfield by Tom Dixon allowing Orrin Bizer a clear run to the line and excellent support play by Colton Windsor providing another try under the posts for an easy Manu Sanchez conversion. Another try soon followed after the second of two strong Woodlands defensive scrums saw Parker Caligari pressure the Lamar no.9 into an error allowing Parker to kick ahead and score, Manu Sanchez again adding the extras to bring up the half-century. Subsequently Hyrum Myers and Dillon Flynn went close before Austin Elliott drove over the line after about 5 Woodlands phases had stretched the home defense to breaking point, and then Lane O’Brien scored in the left corner after good mid-field passing. Lamar did press for a consolation score in the last 10 minutes but the strong Woodlands defense held firm. The Woodlands started the game confidently on the basis of some strong recent performances. After a Katy infringement from the kick-off, Manu Sanchez kicked his pack to within 10 meters of the line, Landon Smith won clean line out ball, Tom Dixon made 10 meters down the center of the field allowing quick ball to be fed out to Orrin Bizer to open the scoring. Despite having much of the possession, The Woodlands were unable to extend the lead other than by a penalty kick from Manu Sanchez in what was becoming an even game permeated by numerous penalties. The Woodlands started the second half even faster than the first with Orrin Bizer adding his second try when Katy couldn’t deal with the kick-off. Katy hit back almost straight away when The Woodlands defense failed to correctly read a high ball allowing the Katy left wing to score from halfway for a converted try, closing the gap to 6 points. The Woodlands hit back from the kick-off again with Tom Dixon making 30 meters, Luke Rizzo and Mattox King going close before Orrin Bizer was tackled high in the act of scoring for a penalty try to make the score 20 to 7. Now dominant, The Woodlands again scored immediately from the kick off with no.8 Tom Dixon running half the length of the field to score close to the posts. Lane O’Brien added another quick try after reading a high kick well then Tom Dixon did the same for his second try of the game, converted by Manu Sanchez. Katy did manage to get a consolation penalty kick but never looked like breaching a strong Woodlands defense. • After a tough run out the previous day, The Woodlands started slowly against Kansas City allowing the opposition to enjoy possession advantage, but with strong tackling from Luke Rizzo and Lane O’Brien in particular Kansas were unable to generate much territorial advantage. When Kansas kicked long, Orrin Bizer read a difficult bouncing ball beautifully and showed the Kansas defense a clean pair of heals to score from within his own half, Manu Sanchez adding the straightforward conversion. • Kansas responded with a number of drives from their large forwards which ultimately lead to a converted try near the posts to tie the scores. • As The Woodlands pressed, Kansas started to give away penalties allowing Manu Sanchez to take a tap penalty and feed Luke Rizzo to put The Woodlands back in the lead, Manu adding the difficult conversion via the crossbar. From the kickoff Manu Sanchez gathered the ball and chipped into the gap but brought down the Kansas City player within the 22, but after yet more Kansas City ruck infringements Tom Dixon took a quick tap penalty and scored from 10 meters, Manu Sanchez again adding the conversion. • The Woodlands continued on top as the second period began and from a scrum 10 meters out Tom Dixon easily beat the defense to score his second try of the game to extend The Woodlands lead to 19 points. This was soon extended to 22 points as Manu Sanchez knocked over a penalty after Kansas were guilty of not releasing after the tackle. • A strong looking Germantown started the game well, dominating both possession and territory during the early stages of the game with only solid Woodlands defense keeping the score even. 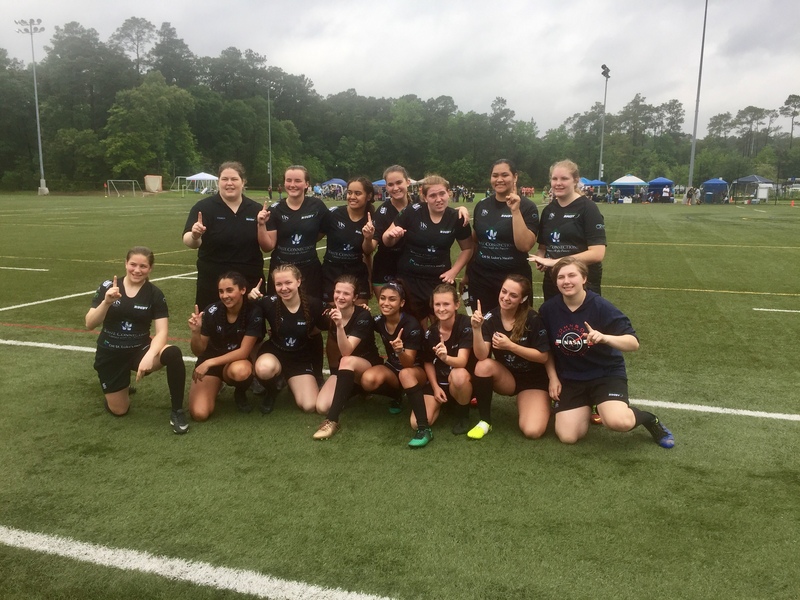 However the pressure was paying off for Germantown and after a couple of penalties were conceded and defended Germantown took a quick tap and scored the opening try as The Woodlands back-pedaled to get onside. • With the restart The Woodlands picked up the pace but despite pressing in the Germantown half weren’t really able to fashion any clear openings and were thankful to Mattox King for a great tackle on the Germantown inside center to keep the scores within one try. 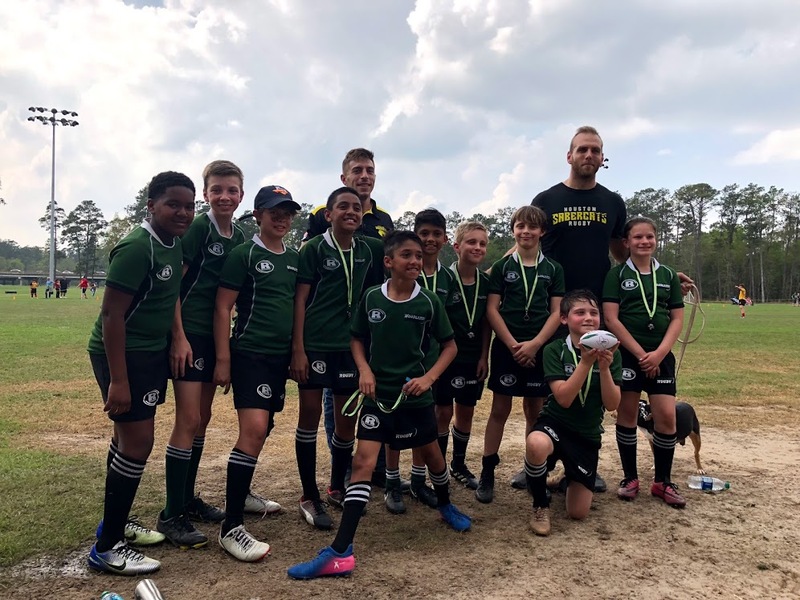 • Slowly The Woodlands started to get on top, and after a number of Germantown infringements, Tom Dixon forced a turnover 15 meters out and darted over the try line to even the score. Shortly afterwards, with The Woodlands scrum starting to win the ball against the head, Woodlands pressure nearly yielded a try for Landon Smith but Tom Dixon’s offload was judged to be fractionally forward. • The Woodlands continued on top as the second period began and from a lineout 10 meters out Luke Rizzo threw long for Tom Dixon to collect the throw and score his second of the match, Manu Sanchez adding the extras. Again Germantown came back and again The Woodlands defense remained tight, slowly wearing down the attackers and kicking long to relieve the pressure. With the ball now deep in the Germantown half, The Woodlands forwards provided quick second phase ball for Orrin Bizer to release fullback Mattox King to beat his man and extend the lead. • Germantown came back again and almost from the kickoff scored down the right wing to draw within a converted try but there was insufficient time left leaving The Woodlands with a hard fought win. • The opening minutes of the game saw The Woodlands attacking strongly but unable to execute on a number of promising openings. However the pressure that was building was rewarded in the 12th minute when Tom Dixon picked from a ruck a couple of meters out to open the scoring by the posts. Tom added a second within 3 minutes from another ruck near the line after his smart interchange with Manu Sanchez almost saw Manu score. • Lake Houston responded strongly to these two scorers and after a few minutes of pressure close to The Woodlands line a further forward drive resulted in a first try for the visitors. The hosts almost immediately restored the 2 try advantage as from a short line-out Jack Johnson entered the line at second receiver and was able to score at will. 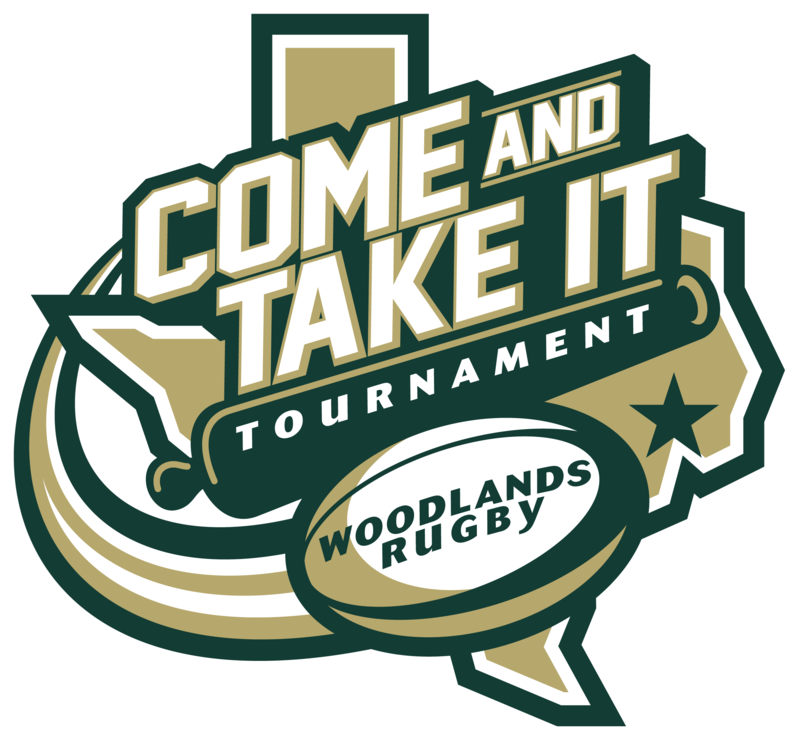 The Woodlands were now well on top and only some strong Lake Houston tackling stopped them scoring again on several occasions until Manu Sanchez took a quick tap penalty to score his sides 4th try, adding the conversion himself. Lake Houston heads didn’t drop and they remained competitive but fell further behind when Landon Smith charged down a clearance kick and fed Lane O’Brien to score under the posts. • The Woodlands were soon further ahead with a penalty try awarded for a high tackle on the try line and resulting in the visitors being down to 14 men, then a stunning run from Orrin Bizer from Manu Sanchez’s double miss pass saw Orrin beat four defenders and score under the posts. Some slick passing along the backs saw Dylan Diangelo score under the posts and then Luke Rizzo added a score after a quickly taken penalty, then added a second after quick second phase ball was won by a now rampant Woodlands pack. • From the restart Cam Markle ran almost the length of the field only to be tackled high for another yellow card and penalty try, whilst Orrin Bizer scored from the halfway line after more neat passing by the home backs. Two more Woodlands tries down the left wing from Jordan Bowers and Landon Smith finished the scoring. A first competitive game of the season saw The Woodlands travel to St Pius for what looked to be a tricky fixture. St Pius started the game very strongly, confidently passing the ball around in both midfield and out wide. A half break by the St Pius 12 was stopped by a cover tackle from Tom Dixon, St Pius recycled the ball twice, creating a gap out on the left for the winger to sprint in for a try which was expertly converted by the St Pius fly-half. The host continued on top after the opening try, but were unable to add to the early try allowing The Woodlands to slowly gain momentum and start to put pressure on the hosts and force errors. From one such error deep inside the defensive 22, Luke Rizzo was able to charge down a clearance kick from the St Pius 12, gather the ball and score under the posts, Manu Sanchez added the simple conversion to tie the scores. As the first half wore on St Pius continued to be slightly on top, but excellent defensive work by The Woodlands midfield of Mattox King, Manu Sanchez and Hyrum Myers supported by the whole pack, managed to keep the hosts out until an infringement just before half time allowed St Pius a relatively straight forward kick at goal to retake the lead. It’s not clear what Coach Frank and his coaching team said to The Woodlands forwards at half-time, but they certainly started the second half strongly. The scrum as front row of Austin, Luke Rizzo and Manny Guzman took charge, and then in the loose forcing St Pius into a number of penalties for not releasing the ball after the tackle. As The Woodlands pressed toward the St Pius line , St Pius began to feel the pressure and infringe. After a late tackle well after the ball had gone on Orrin Bizer was spotted by the referee, Orrin had the chance to level the scores but put his penalty kick just wide of the post from on the 22 meter line. However, The Woodlands pressure was forcing errors throughout the St Pius team with wayward kicks and dropped passes becoming a feature, and with the St Pius scrum going backwards, Parker Callegari was ableto disrupt St Pius ball almost at will. The St Pius line-out was still secure but the service to the midfield slowed allowing Tom Dixon to force a loose pass and almost capitalize but his hack ahead was a fraction too strong and he couldn’t ground the ball before the dead ball line. The Woodlands continued to pressure St Pius inside the hosts half. From a solid scrum Hyrum Myers drew in the St Pius midfield defense allowing Tom Dixon to make 15 meters into the 22. From the recycled ball Orrin Bizer entered the line at pace and wriggled out of two tackles before being caught about 10 meters short. However, rather than go to ground Orrin was able to stay on his feet and was driven over the line by Mattox King and Jack Burgess.With the conversion added, the Woodlands tails were well and truly up. Cam Markle made an incisive break after more weak St Pius handling only for play to be brought back for a high tackle penalty . The Woodlands finally made the pressure tell as Luke Rizzo made immediate amends for a crooked line out throw on the 5 meter line by winning the ensuing scrum against the head, the backs using the ball quickly and once again Orrin Bizer breaking weak tackles to score his second try which Manu Sanchez again converted to extend The Woodlands lead beyond a single try. St Pius did try to force their way back into the game but when the home number 12 was shown a yellow card for a cynical offside offense The Woodlands closed out a well earned but hard fought win. The Woodlands returned to Alden Bridge after two away fixtures in New Orleans for a final pre-season game against West Houston. From the kick off the home side had both territorial and possession advantage. After a number of penalties stretched the West Houston defense Hyrum Myers was able to find space, and feed Landon Smith to touch point near the posts for the opening score, which Manu Sanchez made 7 points with a routine conversion. West Houston came back strongly and only some strong try line defense from The Woodlands kept them at bay. Slowly the hosts got back on top and after being camped on the visitors 22 meter line for several minutes, good back play saw Jordan Bowers go close in the right hand corner and set up quick ball which saw Landon scored his second try of the game with ManuSanchez adding a trick conversion. The next score again came after concerted Woodlands pressure with Tom Dixon taking a quick penalty 5 meters from goal and driving over. Orrin Bizer added a fourth try almost immediately after Manu Sanchez seized on a loose ball in his own 22 and released Orrin to sprint down the left wing with Manu Sanchez adding the extras. On the stroke of half-time The Woodlands added a fifth try after a lovely inside break by Mattox King off a scrum allowed him to feed Manu Sanchez with a perfect overhead pass for Manu to score under the posts for a further 7 points. The Woodlands continued in the ascendency as the second period ended with a half break by Tom Dixon, allowing him to find Manu Sanchez to sprint over in the right hand corner, then after strong running by Tom Dixon and Austin down the center of the pitch, Elijah made ground and from the resulting ruck scrum-half Ben Ure made a darting run down the blindside but was injured in the tackle. The Woodlands continued to press and after a series of penalties in and around the visitors 22, Manu Sanchez fed Tom Dixon from another penalty and Tom scored under the posts for a converted try. After more Woodlands pressure and more penalties, Parker Callegari fed Cam Markle from a 5 meter penalty to score his first Varsity try to bring up the half century of points. Shortly after clean line out ball from Landon Smith allowed Manu Sanchez to free Orrin Bizer with a long pass in midfield who in turn fed Lane O’Brien who finished well in the left hand corner, soon to be followed by Orrin Bizer racing down the same wing for a try under the posts after quick ball created by Cam Markle midfield burst. Orin added the conversion. The next score came from left winger Lane O’Brien after Manu Sanchez was stopped short after being fed by Tom Dixon off a 5 meter scrum, and the ball was recycled out to Orrin Bizerwho freed Lane to score in the corner before Orrin nailed the difficult conversion to give The Woodlands a 69 to nil victory. react and scampered over for the first score of the game. penalties The Woodlands were reduced to 14 men temporarily. second try with the conversion being added. outside, Manu Sanchez adding the conversion to draw level. 22 and another converted try for the Dallas no. 8 to lead by 7.
complete the comeback and the game ended 34-33 to Dallas.